The USMC is in Norway for exercise Cold Response and for other cold weather combat and logistical training with their Norwegian counterparts. During their deployment, Marine tankers get to train for fighting in frigid environments, where their tracks that usually can take them nearly anywhere can turn their tanks into hockey pucks when they hit icy ground. Hence the 62 ton tank drifting session shown in the video below. 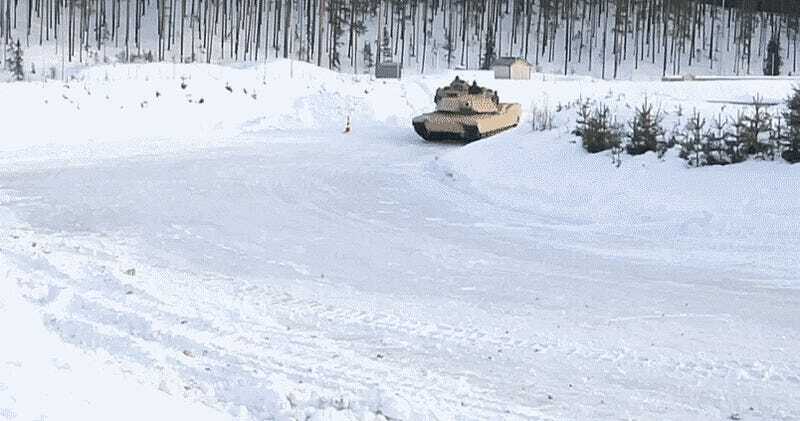 U.S. Marines and their M1A1 main battle tank crews worked with the Norwegian Telemark Battalion on techniques for driving tracked vehicles in extreme winter conditions. You can see one of their Leopard 2 tanks at the 3:15 mark. You can also see USMC AAVs going through similar drift training below. Cold Response is an air, sea and land large force employment exercise that is held in Northern Norway annually. Thousands of troops from various countries participate and considering the arctic could be a flash-point of the future, the cold weather training is more relevant than ever.